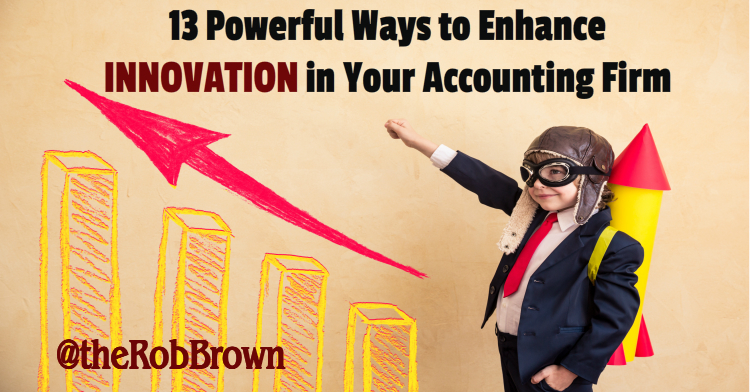 How good is your accounting firm with innovation? People talk about how accounting firms are all the same these days. It's so hard to differentiate. You can claim to be better or different, but your competitors are claiming the same things. My 18 min TEDx talk below states the problem of building a brand around the things others can copy or claim. Many firms pump endless marketing resource into their brand and online presence. Nike and Coca Cola put millions into marketing and PR. For proof. In 2018, Nike's advertising and promotion costs amounted to about 3.58 billion U.S. dollars. A lot of money doesn't always move the dial. And anyway, you don't have that kind of spend. So really where does a stand out marketing position come from for an accounting firm? One answer stands out. Innovation in today's fast paced digital world is a key source of competitive advantage. Why? Because with it, you can authentically weave a different narrative. The pace of change, innovation and progress and never been faster. And from now on, it will never be slower. At the BD Academy, we train your accountants to be more confident, effective work winners. Part of that is nailing your elevator pitches and positioning statements. The best ones revolve around stories of how you've made a difference. And ones that involve innovation make the best stories. Innovation describes something different. Better. Above and beyond. When woven into a story, you've got an avenue to differentiate. Stories compel people to remember you, talk about you, engage with you and buy from you. How equipped is your firm and how set up are your people to innovate? Does your culture encourage creativity, collaboration and enterprise? Recognition. Reward innovation with private and public praise. What you recognise and salute becomes expected and aspirational. Everyone loves praise. Just be careful that some love a fuss and the salutation of their peers. Others prefer a quite 'brilliant job' from someone more senior than them who recognises their brilliance. Empowerment. Encourage suggestions and ideas at all levels. Give people permission to challenge, take calculated risks and speak out. Every meeting, conversation, or project should embrace the kind of 'no blame' or 'no stupid suggestions' mentality that makes people feel confident to share. Expectation. Stress that innovation and contribution is everyone’s job. Often the best ideas come bottom up as opposed to top down. When your workplace is conducive to idea-generation, you increase the chances that creative things happen. Everyone at every level can open a door, solve a problem, see an inefficiency, right a wrong or find a better way. There's a difference between 'it's nice if it happens' and 'this is part of your job' so communicate that throughout your culture. Incentivisation. Provide financial incentives for good ideas. This doesn't necessarily mean money in their pockets, but what about funds to run a networking events, decorate an office, a team night out or employ some admin support? Measurement. Track changes properly to give due credit and avoid duplication. Good measurement also shows you the impact of an idea in terms of money/hours saved, or revenue generated. Once an innovation happens, it needs duplicating, so good systems and recording make that easier. Capacity. Set aside time and space for both teams and individuals to come up with new and better ways to do things. The room to think is rare in modern accounting firms. Meetings run to tight agendas, and diaries run to tight schedules. Innovation is unlikely without the space to look up and 'find a better way'. Support. Coach people to develop their creative and problem solving skills. If creativity wasn't teachable, then a google search of 'creativity tips' wouldn't yield 246m results. Get your teams creative juices flowing with projects that require a little extra brain power. And make an example of your innovation champions by sharing their methods and ideas. Atmosphere. Create fun, exciting environments of positivity for best results. Stale, quiet offices or mundane meetings are not conducive to fresh thinking. Smiling and laughter take relationships to another level. Chaining people to desks, expecting them to crunch numbers and hit utilisation rates is not going to produce better ways to work. Positivity. Crack down quickly on negativity and early judgments of ideas. It's often easier to think up reasons why something won't work, but that stunts the innovation process. Some say criticism comes from cowards who can't think of anything better. Discipline. Turn problem solving and idea generation into habits rather than after-thoughts. It should be a constant practice of asking 'how could we do this better?' or 'what if we...?' What people do regularly becomes a habit. Not merely accepting the status quo should give your staff the rigour and regime to constantly innovate for greater efficiency, client experience, revenue and competitive advantage. Mechanisms. Open up communication lines and avenues to share thoughts and ideas. Firms run groups on Slack, Microsoft teams, Whatsapp, Facebook and other intranets to kickstart conversations. Communication requires a channel. Utilise every bit of technology you can. In our mobile world, it's so much easier to share an idea, ask a question or get some feedback. You've just got to be intentional. Diplomacy. Handle bad ideas well to preserve feelings and keep people contributing. 99% of suggestions probably won't get used. How you handle those is vital for ongoing innovation. You can't afford to shut down a source. The million dollar idea might only come at the 10th time of asking from one particular person, so you've got to keep them engaged for the first 9. Curiosity. Inventors and entrepreneurs are always seeking a better way. They are rarely satisfied with the status quo. They constantly seek improvements. They ask 'what if...' and 'why' in a variety of situations. Whether it's internal systems and processes, increased revenue generation, an enhanced client experience, a better market position or a more productive working environment, they are relentless in their curiosity. Complacency is your enemy! Use your people, your culture, your tech and even your clients to innovate some blue sky between you and your competition. It's doable if you're up for it.